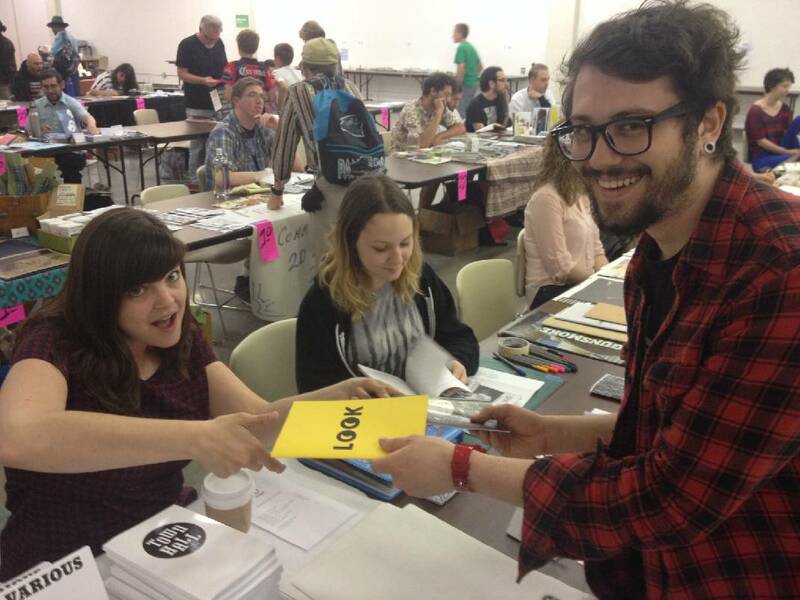 Chattanooga Zine Fest co-founder Aggie Toppins, left, and 2015 volunteer coordinator designer Julie Heavner swap a zine from Aggie's Octagon Press with zine makers from Toronto. 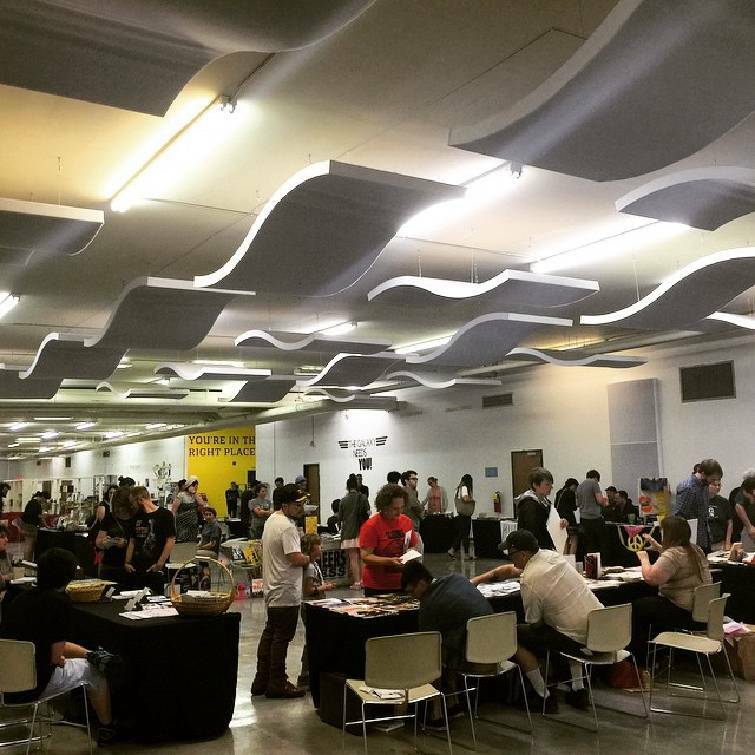 Like the authors and publishers who will be at Zine Fest on Saturday, attendees represent a wide range of interests, including comics, music, pop culture, sports, politics, journalism, art, literature, poetry, cooking, travel and music. › When: 10 a.m.-5 p.m. Saturday. › Where: Chattanooga Public Library, Fourth Floor, 1001 Broad St. In some ways, even though he'll be wearing a VIP badge, Adam Gnade will be looking for many of the same things as everyone else at Saturday's Zine Fest. Gnade, one of the almost three dozen independent writers, vendors and publishers expected for the weekend event, set in the Chattanooga Public Library, hopes to meet some interesting people and discover a book or two that renew his faith in mankind. He also hopes to sell a few of his own works, of course. "I want people to read my work and get something good and sturdy and true from it," says Gnade, an author, singer and songwriter. "I've always hunted — I'm still hunting — for art that makes me feel less alone. I want books and records I can live through for a while and find some kind of solace in. If I can do that for someone else I'm pretty happy at the end of the day. "When it comes down to it, life is mean and grim and stressful a lot of the time. There are some awful, bitter, snarky people out there and that can really put the vice grips on you," Gnade says. "Good art acts as a pressure valve. It's antibiotic, antiseptic, a demon slayer. "I can't begin to list all the ways Victor Hugo's newest translation of 'Les Misérables' or anything by Roberto Bolaño or Jessica Hopper's 'Hit It Or Quit It' zine series have saved me." The third annual Chattanooga Zine Fest, a festival of independently produced and published books, zines and other small publishing works, was started as a partnership with Angie Toppins, a Fine Arts Department faculty member at the University of Tennessee at Chattanooga who curated the Chattanooga Zine Library collection. In addition to a wide variety of newly published zines, the library's collection includes hundreds of donated vintage magazines from private collectors and galleries, some historically and culturally significant from the raw punk and political scenes in the 1980s and 1990s. Zines are mostly small-scale, amateur publications featuring content that is not available elsewhere. There are no limits or rules regarding what zines can be about and they come in a variety of genres, including: perzines (personal journals and oral histories), fanzines (with topics that vary from pop culture to anime to sports), collections or taxonomies, politics, journalism, art and design, comics, literature, poetry, cooking, travel and music. Mary Barnett, who handles public relations and special projects for the library, says Zine Fest is "a really fun celebration of independent publishing" that attracts a wide range of people with all kinds of interests. "The culture of zines is really interesting and diverse so you get this really cool mix of interesting people," she says, "this co-mingling of publishers that are also farmers and college students or whatever. The audience that comes is just as diverse so there is this different energy. It's really collaborative." It's also fairly national in scope. Barnett says she has booked 33 tables for the event with more than half the vendors coming from out of state, including Louisiana, Texas, Missouri, Kansas, Georgia and North Carolina. Attendees will be able to buy and peruse original, independently produced works directly from the artists, and they will have access to public readings and other activities inside the Chattanooga Zine Library. Gnade is affiliated with Pioneers Press, a publishing house and small-press distributor that focuses on sustainability, health, gender, sexuality, social justice and food movements, as well as up-and-coming authors. It is located on a working farm in Kansas, where Gnade also lives and works on his music, his writing and stuff that needs doing around the farm. Getting his hands dirty while working up a healthy sweat is good for the mind, body and soul, he says. "It's easy to stay up in your head when you're writing for a living," he says. "But it's not enough. You won't write as well as you can if you're staying put all the time. "If you're lucky enough to be able to do it, getting out there and using your body for something physical will help you think better. It'll jam oxygen up into your brain; get your heart pumping like a wild motor. I think best when I'm swimming in a river or pushing a tiller through hard ground or getting thrown around at a punk show. I believe in the healing power of the 'strenuous life' Teddy Roosevelt talked about." Gnade has written several novels and novellas, including such titles as "My Brain Was a Shark Eating Itself" and "They Will Stand On You and Spit"; he also has made several recordings of what he calls "talking songs" which are connected by characters who appear in many of his works, though each can stand on its own and doesn't require the reader to follow along in sequence. "My life project is a series of books and 'talking song' records with characters and plotlines that exist in the same world," he says. "The original intent was something along the lines of books that read like records and records that sound like books. It's not necessary to read or hear them in order, but once you get through a few of them you'll start understanding the characters better and you'll see the whole story as it develops," he explains. "It's kind of this big puzzle I've been building since my first record came out about 10 years ago. I've got it all mapped out. There's a lot to tell." For the first time, Zine Fest is partnering with Undaground Radio, a new artist-powered streaming radio app that which will host and produce a Chattanooga Zine Fest radio program and premier it this coming summer. Zine vendors will be interviewed and submit companion music playlists for their zine which will be shared on the Undaground Radio show along with their interviews. "I'm really excited and looking forward to interviewing some of these guys, especially Adam," Barnett says. Audience members will not only be able listen to artists discuss their work, they also can come find those artists' zines at the library to learn more. Another addition this year is the release of a collector's series of locally designed buttons, a popular merchandise item at zinefests across the country. The buttons are designed by Chattanooga graphic designers Steven Eddy, Katie Severson and Matt Murphy, who also volunteered to help produce this year's fest with the library. All three are recent alum from UTC's Society of Ink and Paper, part of the university's Fine Art Department Graphic Design program. Along with other members of the society, they helped create the festival in 2014. Contact Barry Courter at bcourter@timesfreepress.com or 423-75-6354.